Be the first to know availability when adding your name to the waiting list. 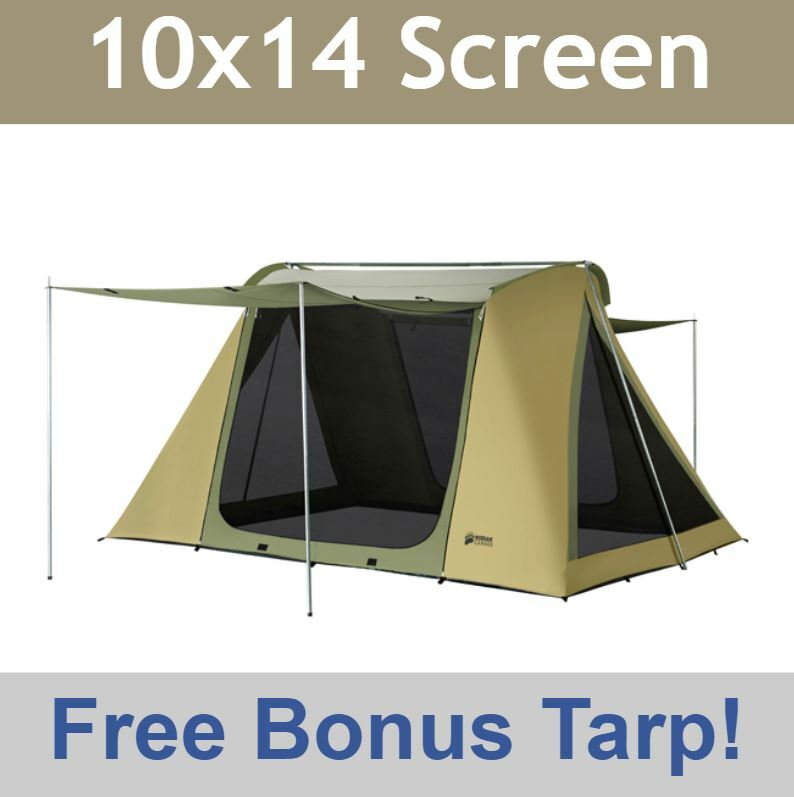 Complete your camp with this rugged all-season screen house. It's the perfect retreat from bugs, sun, and weather. Place it over a picnic table to create an ideal dining area, or set it up to add a comfy living space. 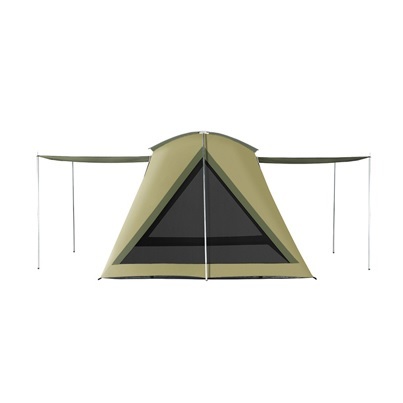 This is built on the popular and sturdy Flex-Bow frame with tempered, spring steel rods that keep the tent taut. Its 1 inch steel tube poles will hold up to fierce winds. The screen house features Hydra-Shield 100% cotton duck canvas on the ceiling, and poly cotton, rip stop canvas on the walls. For ventilation and openness, the screen house is equipped with four large windows. 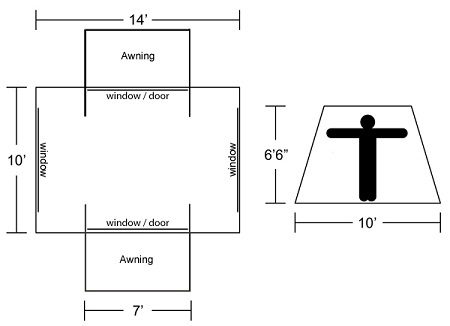 The versatile side walls (front and back) can be rolled up, or extended out with poles into a small awning. Zip shut the side walls and/or windows for stormy weather, or privacy. Screen side walls can be rolled up for access or to create an open air atmosphere. Easy, one-person setup takes only a few minutes after you have staked it out. The steep walls and 6'6" high ceiling provide a roomy interior with stand-up, walk-around comfort. A customizable organizer system offers convenient places to stow smaller items. The screen house has an open bottom no sewn-in floor. This allows you to place it over a fixed picnic table. It is equipped with a poly fringe sod cloth around the bottom inside perimeter. This helps to seal out crawling critters. 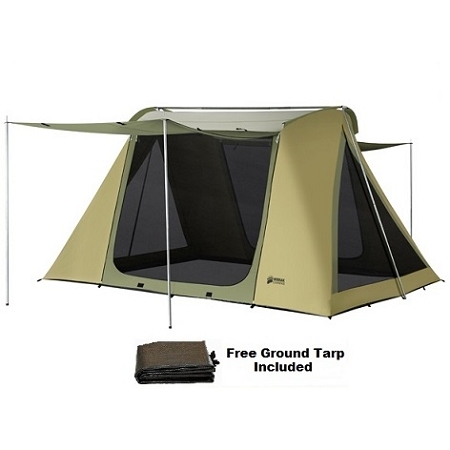 Comes with a duffel style storage bag and hefty, 12 inch steel, tent stakes. Note that the screen house is not free standing, it needs to be staked down or anchored in order to stand. Limited Lifetime Warranty and Hydra-Shield 100% Cotton Duck Canvas ceiling. Spacious 6'6" ceiling height provides walk-around comfort. Two large entries/doors/windows (front and back) with #10 YKK zippers. 4 large windows (ends) with no-see-um mesh. Zip shut from inside. Two 7 x 6.5 Ft. awnings. Customizable organizer pockets. Pack Size: Tent Length 38" Diameter 10" Poles Length 48" Diameter 6"
CEP is an authorized distributor of 6714 10x14 Screen House. 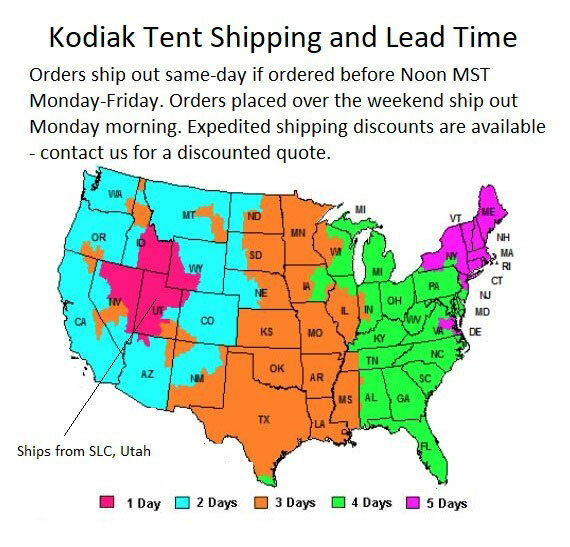 I put up the Kodiak Screen House (#6714) that I purchased from your company at Bogart Park in Inland Empire. I must say, this is a very impressive structure! It's the perfect size for the park and I didn't have to worry about finding a park picnic table because I was able to fit everything I needed right inside the screen house! A very nice shade tent. It makes easy ups look bad. 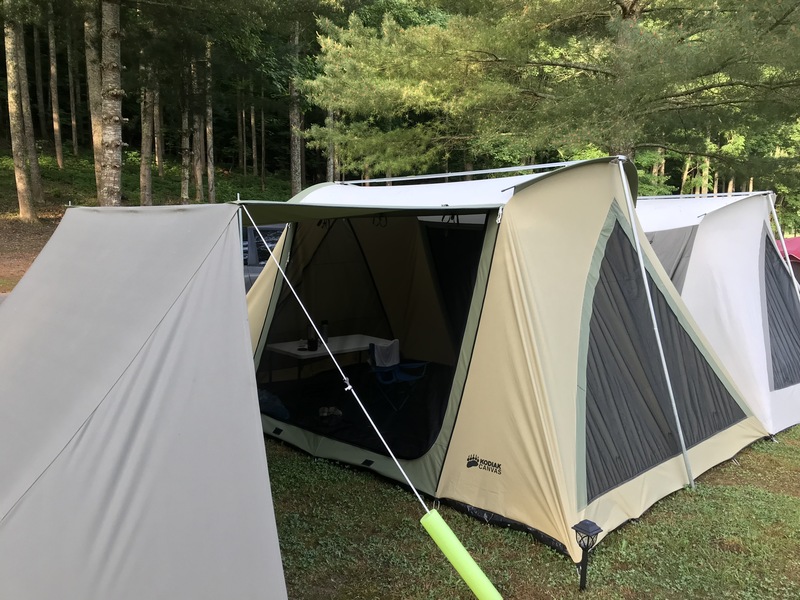 This screen tent is amazing! We use it for camping and a place out of the sun to eat and play games. It is very sturdy and also very roomy. Unlike the tents the stake loops are plastic. I hope that doesn't cause a problem with the longevity of the product. I love the awnings on both sides. A happy camper for the quality of the screen house. Just put it up for the first time and am very impressed so far. The jury is still out of course on longevity. The screen zippers get a fair amount of use. This unit is very spacious. The large screen area keeps the interior very cool. Rain does get in around the sides of the awning. I used the Kodiak tarp which serves as a great footprint guide when staking out the house. I also took the precaution of duct taping the inner skirt to the tarp to keep out critters and dust. (actually used the stickier gorilla tape.) So far so good. Time will tell. Seller Response: we do stand behind this product with the lifetime warranty, but this is a user-caused issue and was ordered 3 years ago. If that is discovered upon delivery it could be damage in shipping, but not likely since it was not reported until 3 years after the purchase was made. A patch kit would fix that right up. Q: Is this screen house treated with fire retardants? A: It is not fire retardant. Q: I have heard that some of these have plastic stake loops while others have the original webbing. Which style do you have in stock? A: All of the tents with the exception of the screen house that you are asking about have the metal reinforcements now. Feel free to contact us with any other questions. A: I too would like to know. Do the shelters have the plastic loops, or the webbing? A: This is actually not a tent, but a screen house. It has no floor and cannot be sealed off completely from the outside. The product definitely is more suited for lounging and doing the activities you outline.